Ants, ants everywhere? Are the little critters driving you mad as they march along in and out of your house and garden in what seems to be their millions? Do their sheer numbers send you running for the closest weapon of mass destruction?! Hang on a minute…let’s first consider how these little creatures benefit us, before we start wiping out whole colonies. Ants help to break down and recycle organic matter and play a very important role in the formation of top soil. They are capable of adding up to 30mm of topsoil to the surface every year! They also bring nutrients up to the surface, further enriching the soil. With their tunneling, they help to aerate soil, and because they prefer poor soils, all the better as it help to improve the quality of the soil. The tunnels also make it easier for water to penetrate and drain into the soil. They help in the break down and removal of dead carcasses of insects and animals. They kill off destructive pests by eating the larvae of flies, fleas, bedbugs, cockroaches and beetles that can cause damage and disease to humans and plants. They, in turn, serve as food to animals that are of benefit to our gardens, like birds, lizards and frogs and they form the largest part of the diet of some creatures like ant lions and woodpeckers. 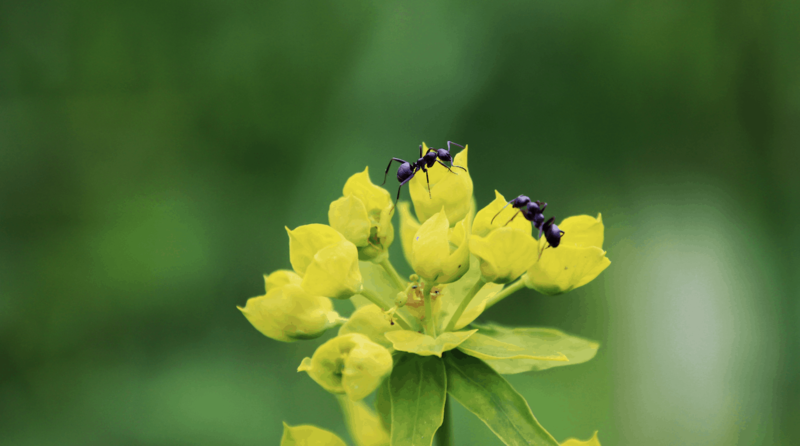 Certain ants play a big role in harvesting, protecting, nourishing and spreading seeds in their natural habitat. So ants will and should always be present in a healthy, living garden. Most ants are carnivorous and are not necessarily after your plants, but more likely, what’s on your plants. Ants love the sweet honeydew excreted by aphids, white flies and mealy bugs, so much so that they will actually protect them from their natural enemies and farm them to keep the honeydew supply going. Check your plants for these insects and treat with an appropriate organic pesticide for soft bodied insects only. If the infestation is mild, especially on indoor plants, the little pests can be removed manually with a soft cloth. Try and avoid killing beneficial insects. If you get rid of the aphids and others, the ants will mosey off to another food source. Firstly healthy plants, grown in healthy soil, will be more resistant to pests, like aphids and as stated above, no aphids = no ants. Secondly, ants prefer a poorer, more acidic soil. Loosen the soil, rake in some agricultural lime at the rate if 25g/125ml per square meter and apply a thick layer of compost. Watering the area well will also aid in the nest collapsing. Repeat this process every 3 months until the soil quality improves and the ants have moved to poorer pastures. Do not use dried grass as mulch when you have a harvester ant problem. Trim lower growing branches that touch the soil off taller plants, like citrus trees, rose bushes and shrubs to leave only one stem for ants to gain access on. Wrap the trunk with a collar of strong paper smeared with syrup, molasses or grease. A very easy option is the Fruit Tree Grease Band stocked by Lifestyle Home Garden. Once ants have discovered a good source of food, they leave a pheromone trail for their fellow workers to follow to and from the nest. Disguise this by sprinkling a strong smelling spice like pepper, mustard or chili along it. Surfaces in the house can be wiped with a strong lemon or vinegar solution. Ants in the house are after sugars and proteins, so clean up all spills, sweep up all crumbs and store food and open packages in airtight containers. Interplant the garden and vegetable patch with plants that have ant repelling properties, like lavender, mint, tansy, rue, pennyroyal, thyme and yarrow. If you have ants in your pot plants, submerge the pot in water almost to the top. The water should drive the ants out of the soil. When you water your pot plants, rather water deeply less often until the water runs out the bottom of the pot (Click |HERE| to learn more about watering your plants). This will ensure that all the soil in the pot is drenched – no dry bit for ants to hide. Use a good quality potting soil and feed regularly to keep soil and plants healthy. If you have pets, clear food and water bowls away immediately after they’ve eaten or place bowls outside. Seal off possible entry points around door and window frames. These points are very easy to locate…just follow your line of ants. They usually leave a telltale little heap of dirt at the entry point as well. In the case of severe infestations mix equal parts of icing sugar and borax. Put some down on a piece of wood or a stone or a flat saucer if indoors, near a problem area. The ants, going after the sugar, will eat the bait and take it down into the nest where the borax will eventually kill the colony over a few weeks. Commercial ant traps can be put down – they are available for indoor and outdoor use. Make sure they are put on an ant trail, but out of reach of children and pets. Ants will feed the bait to their larvae and the queen and, as above, this will eliminate the colony in a few weeks. Locate the nest and pour boiling water down it. This will kill a lot of the ants and cause the nest to collapse. Eeeek, but at least there’s no harm done to the environment.